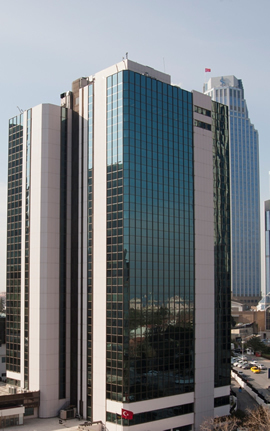 This SwissOffices Business Center, situated on the 17th floor of a 20-story building above the hustle and bustle of the city offers you fully-furnished and fully-equipped offices, some of them with Bosphorus view, at the very center of Istanbul's commercial heart, with easy access to road transportation and metro lines. There is a wide choice of alternative packages for services and amenities to satisfy your business needs and budgetary considerations. SwissOffices at YKP, is an opportunity for an exceptional experience in Istanbul not only because of its closeness to metro lines, both Bosphorus bridges and other means of commuting, but also its location surrounded by the city’s bustling shopping malls, entertainment spots, restaurants and classy bars. Because of its closeness to the Trans European Motorway (TEM), Istanbul Ataturk Airport is reachable in 35 minutes by car. Access road to the Fatih Sultan Mehmet Bridge over the Bosphorus is just in front of the building and the Bosphorus Bridge is also close to this location. Airport: 35 minutes drive to Atatürk International Airport.